Natalie A. Remien is an Intellectual Property and Privacy attorney. 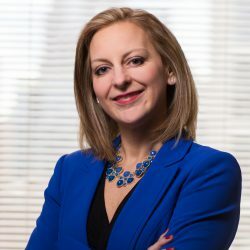 Natalie is the Chair and Founder of the firm’s Privacy and Data Security Practice Group, where she leverages her understanding of business and IT to assist clients in identifying areas of corporate risk and mitigating such risk through regulatory compliance and corporate governance at all levels of the organization. Through corporate agreements, employee policies and training, privacy notices and terms of service, appropriate insurance coverage, and security breach notification strategies, Natalie helps companies decrease risk of lawsuits, fines and damage to corporate goodwill and reputation in the marketplace. Additionally, Natalie has nearly two decades-worth of experience intellectual property identification, counseling, protection, licensing and enforcement. Counseling businesses concerning regulatory compliance with emerging privacy and data security. Assisting businesses with creating policies and procedures at all levels of the company to address consumer privacy issues and to develop security breach mitigation. Counseling clients with respect to trademark, trade dress, trade secret, domestic and foreign prosecution, brand clearance and domestic and pre-litigation enforcement. Developing and implementing budgets and branding strategies for clearing and registering numerous marks worldwide in a cost effective and efficient. Managing global trademark portfolios for a diverse range of clients including large worldwide retailers. Prosecuting and enforcing large trademark and copyright portfolios as in-house counsel for a multi-national toy company. Negotiating and preparing license agreements and worldwide co-existence. Representing proceedings before the Trademark Trial and Appeal Board. Natalie is a champion for business owners and has a particular affinity for representing companies that provide goods and services for children. To that end, Natalie is a Preferred Provider to the American Specialty Toy Association, and a regular writer and contributor to the Chicago Toy and Game monthly newsletter. Although Natalie has represented many clients in diverse industries, her passion lies in representing companies in the toy and gift arena, with particular emphasis on children’s educational development and security of smart and connected toys.